Convert virtually any video/audio file formats in batch! 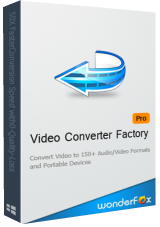 Video Converter Factory Pro 8.8 was available as a giveaway on December 17, 2015! WonderFox Video Converter Factory Pro provides a unique encoding technology, which supports 50X faster conversion speed. You can batch convert virtually any video/audio file formats. 200+ Audio/Video Formats and Portable Devices are supported. Also powerful but easy-to-use edition functions are provided as well. The Christmas deal for GOTD users: Get WonderFox Video Converter Factory Pro for $14.95 for 1 PC! How would you improve Video Converter Factory Pro 8.8? I've been using WonderFox DVD Video Converter v6.5 for a long time now, from GOTD. It worked fairly well for me with occasional issues/errors. I would convert some of my kids' DVDs to a format that could work on our tablets. I decided to install this newer version but was unsuccessful. I downloaded and unzipped the file, ran the Setup, and then a GOTD window appeared that said, "Successfully activated" and the registration key was provided. Once I close this window, my browser launches with a web page message from GOTD. In the end, I can only find my original v6.5 DVD Video Converter program. I can't find the Video Converter Factory Pro anywhere. It doesn't appear in my Programs and Features listing or have any desktop icon. I tried to run the Setup a few times but couldn't locate the program on my computer afterward. I even tried to uninstall the v6.5 DVD Video Converter program first. The v6.5 desktop icon ends up deleted but not the program or files. It still appears in the Start button listing of recent programs and under All Programs. This giveaway offer could not be successfully installed on my computer. I've been using WonderFox DVD Video Converter v6.5 for a long time now, from GOTD. It worked fairly well for me with occasional issues/errors. I would convert some of my kids' DVDs to a format that could work on our tablets. I decided to install this newer version but was unsuccessful. I downloaded and unzipped the file, ran the Setup, and then a GOTD window appeared that said, "Successfully activated" and the registration key was provided. Once I close this window, my browser launches with a web page message from GOTD. In the end, I can only find my original v6.5 DVD Video Converter program. I can't find the Video Converter Factory Pro anywhere. It doesn't appear in my Programs and Features listing or have any desktop icon. I tried to run the Setup a few times but couldn't locate the program on my computer afterward. I even tried to uninstall the v6.5 DVD Video Converter program first. The v6.5 desktop icon ends up deleted but not the program or files. It still appears in the Start button listing of recent programs and under All Programs. This giveaway offer could not be successfully installed on my computer. I just compared Video Converter Factory Pro 8.8 with Handbrake 10.2.7286. The file was a 350MB .avi file (length: 50:34) being converted to a 640x480 mp4. Barring further information, I'm not overly impressed with VCFP's "unique encoding technology which supports 50X faster conversion speed." I just compared Video Converter Factory Pro 8.8 with Handbrake 10.2.7286. The file was a 350MB .avi file (length: 50:34) being converted to a 640x480 mp4. Conversion times: Video Converter Factory Pro 8.8: 24 minutes Handbrake 10.2.7286: 8 minutes Barring further information, I'm not overly impressed with VCFP's "unique encoding technology which supports 50X faster conversion speed." If I have WonderFox DVD Video Converter 8.7 do I need WonderFox Video Converter Factory Pro 8.8. What is the difference in the two. Also can you have both of these programs installed on the computer at the same time or is one program better than the other? Like to thank Jenny from Wonderfox for answering the question posted here today. Ran some tests against my usual Aiseesoft products and general conversion rates were 50% slower. Also noted that the sizes of VP9 files had little in the way of the small file sizes that I was expecting. Any attempt at H265 conversion would result in the program crashing. There isn't really much that separates this from any of the competition for me and therefore won't be remaining on my system. Ran some tests against my usual Aiseesoft products and general conversion rates were 50% slower. Also noted that the sizes of VP9 files had little in the way of the small file sizes that I was expecting. Any attempt at H265 conversion would result in the program crashing. There isn't really much that separates this from any of the competition for me and therefore won't be remaining on my system. Sort of applies to todays offering. In the comments Wonderfox suggests uninstalling prior versions. When I did, they popped up a survey request to learn why the program was uninstalled. The survey page has some Chinese (?) text, but no functional survey. Just thought they might like to know. Thanks for the newer version. Sort of applies to todays offering. In the comments Wonderfox suggests uninstalling prior versions. When I did, they popped up a survey request to learn why the program was uninstalled. The survey page has some Chinese (?) text, but no functional survey. Just thought they might like to know. Thanks for the newer version. My Dropbox is down due to too much traffic. <b>Ootje</b> My Dropbox is down due to too much traffic. I bought (yes, that's hard to believe) the DVD Video Converter. It's the "do all" tool for me. I've toyed with various giveaways and free tools, but this one is a "no brainer", and Wonderfox is amazing (not to be confused with WonderS*, which isn't amazing). I've reconverted mots of my library to mp4 (h264) with this program. No negatives to report. Hello, I have quite a number of vhs tapes that I want to convert to dvd for safer keeping. I already have a vhs to dvd converter device, but I'm looking for a program that will allow me to edit the dvd content( cut, paste, add text etc). I already downloaded and installed this promo, can anyone tell me if they used it for this purpose, and how well it worked? Thanks ! No, the GOTD-program can not do that. It can a clip, but just one. You should search for a real video-editing program. Years ago I edited 3 DVD's, 4 video's to one DVD with such a program. It takes time AND a lot of HD-space. 50 GB or so. <b>skypaintr1</b> No, the GOTD-program can not do that. It can a clip, but just <b>one</b>. You should search for a real video-editing program. Years ago I edited 3 DVD's, 4 video's to one DVD with such a program. It takes time AND a lot of HD-space. 50 GB or so. I have tried a lot of programs for the and VSDC Free Video Editor is the one I like best. And its freeware. <b>skypaintr1</b> I have tried a lot of programs for the and VSDC Free Video Editor is the one I like best. And its freeware. When I reviewed the program in June, the converter only downloaded YouTube videos up to 720p, but now it supports downloading 1080P, 4K, 8K videos from YouTube. However, the giveaway program seems to be only a video converter and it does not support YouTube downloading, nor creating iPhone ringtones. WonderFox HD Video Converter Factory Pro therefore is more recommended and it is in such a great discount. I have reviewed WonderFox DVD Video Converter, which is a combination of the featured program HD Video Converter Factory Pro and DVD Ripper Pro. http://www.wormtechs.com/2015/06/wonderfox-dvd-video-converter-review/ When I reviewed the program in June, the converter only downloaded YouTube videos up to 720p, but now it supports downloading 1080P, 4K, 8K videos from YouTube. However, the giveaway program seems to be only a video converter and it does not support YouTube downloading, nor creating iPhone ringtones. WonderFox HD Video Converter Factory Pro therefore is more recommended and it is in such a great discount. Windows NT4/ 2000/ 2003/ XP/ Vista/ 7/ 8"
"System Requirements: Windows NT4/ 2000/ 2003/ XP/ Vista/ 7/ 8" Win 10 not supported??? I did install it in a Win10-64. Not all the conversion's did work. Maybe the lack of codec's was the problem. <b>nissepelle</b> I did install it in a Win10-64. Not all the conversion's did work. Maybe the lack of codec's was the problem. But some did OK.
No Win 10 support apparently. ... Big drawback. ok have used this company before and found not to bad. so, installed and says to rip audio from a 10gig video that is 8 hours long will take ABOUT 45 minutes to 1 hour. that is a LOT slower than Audials One which is what i normaly use. will have to see about the quality of sound and other things after the conversion. Here's the comparison to the different software products listed for their holiday sale. It wasn't trivial to find the comparison sheet as I was looking at the individual products from the dropdown. Thanks for posting this is useful. I have been using Wonder fox dvd video converter 6.5 for transferring some DVD's to MKV files and some MKV files to mp3 audio only. I have been happy with the output. I had some problems with the batch conversion wanting to repeat the same file and not continue to the next file, and had to manually start and stop some of the file conversions. I am using an older version of this software so this may not be an issue now. The program DVD converter has a very simple and intuitive interface. Looks like this one posted today does as well. It is always a chore to go to most software developer's websites and try to easily sort out the differences between products. Thanks to Wonderfox and GAOTD for this offering. I do not usually have time to do much testing before deciding about a download so I do read and appreciate the postings of other users here. <b>Jerry</b> Thanks for posting this is useful. I have been using Wonder fox dvd video converter 6.5 for transferring some DVD's to MKV files and some MKV files to mp3 audio only. I have been happy with the output. I had some problems with the batch conversion wanting to repeat the same file and not continue to the next file, and had to manually start and stop some of the file conversions. I am using an older version of this software so this may not be an issue now. The program DVD converter has a very simple and intuitive interface. Looks like this one posted today does as well. It is always a chore to go to most software developer's websites and try to easily sort out the differences between products. Thanks to Wonderfox and GAOTD for this offering. I do not usually have time to do much testing before deciding about a download so I do read and appreciate the postings of other users here. Does anyone know how this differs from HD Video Converter Factory Pro 8.6 that was a previous GAotD? I've got several video converters - but still looking for one which will convert people's attempts that have resulted in "Keyhole-like" viewing files. I reckon that what is REALLY required is a conversion program that WILL allow the user to drag and expand the width & height to a proper aspect ratio without persons looking like giants in height & "Twiggy" in body. i.e. I want the resulting converted file to be 720x404 - or something approaching those numbers. I've tried many different "converters" and most seem to unilaterally decide exactly WHAT selection of sizes they will convert to. At present, I find that an older version "WinX HD Video Converter Deluxe" is somewhat adjustable. I've got several video converters - but still looking for one which will convert people's attempts that have resulted in "Keyhole-like" viewing files. I reckon that what is REALLY required is a conversion program that WILL allow the user to drag and expand the width & height to a proper aspect ratio without persons looking like giants in height & "Twiggy" in body. i.e. I want the resulting converted file to be 720x404 - or something approaching those numbers. I've tried many different "converters" and most seem to unilaterally decide exactly WHAT selection of sizes they will convert to. At present, I find that an older version "WinX HD Video Converter Deluxe" is somewhat adjustable. There are definitely kinds of video converters. And it took a long time that we updated Video Converter Factory Pro to version 8.8. We make regular Market Researches all the time. Video Converter Factory Pro is equipped with advanced encoding technology, and supports Intel® Core TM, NVIDIA® CUDATM and AMD® to generate faster video conversion speed than many likewise converers. And if you don't want to lose quality, you'd better have a try. Thank you. Does it convert Audible files? Format Factory is the BEST and is free, free, free! Format factory is quite good but last time I installed an update to it it removed some shell extensions I regurlaly used, more so than the actual program!. I have found Xmedia recode to be more flexible and controllable than format factory and it does not have any install time offers to avoid like I got with previous format factory install experiences..
<b>Southern</b> Format factory is quite good but last time I installed an update to it it removed some shell extensions I regurlaly used, more so than the actual program!. I have found Xmedia recode to be more flexible and controllable than format factory and it does not have any install time offers to avoid like I got with previous format factory install experiences.. Question: I have version 8.6 from here, and I want to upgrade with this giveaway. 2) Uninstall 8.6 first before installing 8.8? 3) Install 8.8 in a new folder? Whats the best way to install? <strong>Question:</strong> I have version 8.6 from here, and I want to upgrade with this giveaway. Should I: 1) Install new over 8.6 2) Uninstall 8.6 first before installing 8.8? 3) Install 8.8 in a new folder? Whats the best way to install? Thanks! The best way is to uninstall version 8.6 first. :) Thanks for your support always. I have HD Video Converter Factory Pro 8.6 from GAotD and I don't know if this is an upgrade to that or different, are you sure which product you have v8.6 of? <b>Powder_Skier</b> I have HD Video Converter Factory Pro 8.6 from GAotD and I don't know if this is an upgrade to that or different, are you sure which product you have v8.6 of? I can't see any mention of streams other than video and audio on your website. I would like to convert an mpeg program stream file that includes DVB subtitles to a Transport Stream file (.ts) whilst retaining the DVB subtitle stream. Please implement. I can provide samples if needed. You asked for suggestions, so here's mine: I can't see any mention of streams other than video and audio on your website. I would like to convert an mpeg program stream file that includes DVB subtitles to a Transport Stream file (.ts) whilst retaining the DVB subtitle stream. Please implement. I can provide samples if needed. Video Converter Factory Pro can definitely support you to convert the mpeg file which includes DVB subtitles to TS file. But the DVB subtitle can't be retained cause it wil be turned to hard subtitle. 1. I cannot see "Transport Stream" as an option under "Output Format". 2. When I convert to something else, the DVB subtitle stream is dropped - not retained nor "turned to hard subtitle". My suggestion to improve this software and have a unique product is to work on all streams in a file, not just video and audio. <b>Jenny</b> Your answer confuses me because: 1. I cannot see "Transport Stream" as an option under "Output Format". 2. When I convert to something else, the DVB subtitle stream is dropped - not retained nor "turned to hard subtitle". (Maybe it hard-codes them if you "add subtitle" from a file, but it totally ignores the subtitle stream contained within the file.) My suggestion to improve this software and have a unique product is to work on all streams in a file, not just video and audio. Not a bad program. That's the simple video transcoder I really need. Thanks for GAOTD and WonderFox. I just want to know what is the differences between Video Converter Factory Pro and HD Video Converter Factory Pro. Please advise. Not a bad program. That's the simple video transcoder I really need. Thanks for GAOTD and WonderFox. I just want to know what is the differences between Video Converter Factory Pro and HD Video Converter Factory Pro. Please advise. Installed and registered without difficulty, opened up to very pleasing interface. Particularly like this company’s output selection, much better than the lists we see in many video converters. Tested on a 210 MB FLV file to MP4 of 200 MB, it took 15 min to do this with a heavy load put on the CPU. Also did a quick test with the same file to WEBM format; stopped after a minute or so and thankfully it did not delete the partial video file. Personally I like this as I can view what the finished output would be like without having to convert all the file. The output it produced was very good. Have always found this company's products to be pleasing to use, easy to read interface and good functionality. I have their HD edition of video converter a whole year. It's a real good converter software that has a few special features. So I believe this software is also not bad. I have their HD edition of video converter a whole year. It's a real good converter software that has a few special features. So I believe this software is also not bad. Thumb up for GAOTD! Christmas is coming up soon. May your life be filled with joy and happiness and may each new day bring you moments to cherish. And thank you for your supports, always. This time, We’re pleased to inform you that we bring you our Video Converter Factory Pro Version 8.8.